Representative Honours: Northern Ireland: 6 Full Caps (1960-1966), 1 Amateur Cap (1960); Irish League: 2 Caps (1960). Club Honours: (with Barnet) FA Trophy Runner-Up 1971/72. 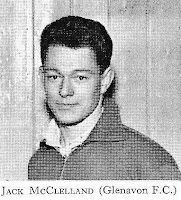 Baby-faced goalkeeper Jack McClelland emerged through the ranks at Glenavon, taking over the 'keeper's jersey from Roy Rea. 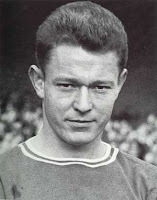 His performances, particularly during the club's participation in the 1960 New York Tournament, earned him an Amateur cap and Inter-League honours. In October 1960 he was snapped up by Arsenal manager George Swindin for £7,000. Within days of his arrival at Highbury, and before even making the Arsenal first eleven, McClelland was handed his international début by Peter Doherty, as a stand-in for Harry Gregg, in a World Cup qualifier against West Germany. He was never going to live up to Gregg's performance in that 2-2 World Cup Finals draw in Sweden, the last time the Germans faced the Irish - Germany recording a 4-3 win, despite a Billy McAdams hattrick. The following spring, with Gregg again unavailable, McClelland found himself back in the number one shirt, as a badly weakened and inexperienced Northern Ireland side lost 5-1 to Wales then set off on a tour of Europe. A friendly in Italy and World Cup qualifiers in Germany and Greece each ended in defeat by a single goal (3-2, 2-1, 2-1), but, as so often in their history, Northern Ireland could claim the 'moral' victory. And that was that - al least for another five years. Gregg returned to the side, Vic Hunter, Ronnie Briggs and Bobby Irvine all acted as stand-in and then Pat Jennings appeared on the scene, before McClelland, by now a Fulham player, could earn his sixth and final cap. 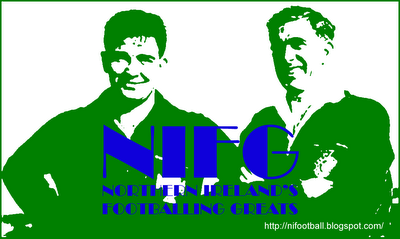 Northern Ireland ran out 4-1 winners over Mexico, the only time they had won with McClelland between the sticks. McClelland signed for Fulham in December 1964 but had to wait a year for his debut in a 3-2 defeat by Stoke on 4th December 1965. He was a key player as the Cottagers escaped what looked like certain relegation that season, but thereafter was in-and-out of the team. In 1968/69 he spent several months on loan at Lincoln as stand-in for the injured John Kennedy, before returning to Fulham to make his final League appearance in a 3-2 defeat at Crystal Palace in April 1969. That summer McClelland left Craven Cottage for Southern League Barnet, where he was to spend the happiest spell in his career. In 1972 he played at Wembley in the FA Trophy Final and he picked up the club's Player of the Year award in 1974/75. Shortly afterwards McClelland fell ill with cancer, and he died in 1976. He was just 35 years-old. Summary: 6/0. Won 1, Drew 0, Lost 5. Hi i’m Kiernan McClelland. I just wanted to say that Jack McClelland, was my great uncle. I am the grandson of Jack’s brother, Bill McClelland and almost all of the McClelland clan now are either living in Canada or Northern Ireland. Also I would like to say that this website potrays Jack’s goaltending experance very well and I makes me proud that people can see some of our history. HI MY NAME IS BILLY DICKSON NEPHEW OF BILL DICKSON ARSENAL AND CHELSEA STAR OF THE 1950 BILL BECAME HEAD SCOUT FOR ARSENAL WHEN A SERIOUS INJURY ENDED HIS PLAYING DAYS. I CAN REMBER HIM TELLING ME ABOUT SIGNING JACK FROM GLENAVON.HE SAID JACK WAS ONE OF THE BEST SIGNINGS HE MADE FOR ARSENAL.